LG is having a Nokia problem. Like Nokia, LG has launched a series of powerful, attractive devices in the last year--including both the current and previous-generation Google Nexus smartphones. But just like Nokia, LG hasn't managed to pick up much traction with consumers. Even worse, LG can't blame its problems on its software platform, either: It's using Android, the world's most popular mobile operating system. LG's biggest problem is that it hasn't done much to stand out from the crowd. To be fair, that's hard to do when you have Samsung, South Korea's dominating force in consumer electronics, reeling in a large chunk of global marketshare. With its relatively middle-of-the-line products, LG isn't doing much to set itself apart from the competition, and its new entry in the tablet market, the 8.3-inch G Pad, won't do much to establish relevance either. 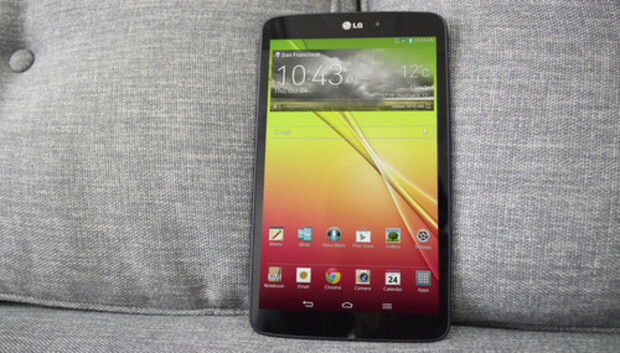 The LG G Pad is a smart-looking device. It's thin and light, and though it's a bit bigger than the second-generation Nexus 7 and iPad mini, it's not any less comfortable to hold. I actually liked typing on this device two-handed--both in portrait and landscape mode--more so than other tablets I've used. Its overall form factor hits that sweet spot between the too-big Galaxy Note 10.1 tablet and the compact, 7-inch Kindle Fire HDX. LG gave the G Pad a premium look and feel by dousing more than a third of the chassis in brushed aluminum metal. It feels sturdy--like it's not going to shatter when you drop it. You'll also appreciate that there's an accessible MicroSD expansion slot available on the top of the device. That's a rarity in today's tablet market. Perhaps LG's only odd design decision was to put both speakers on the back of the device rather than on the bottom-front. The speaker placement is such that your hands won't muffle the sound when you're holding the tablet, but if you want to bump Spotify around the house, you'll have to lay the tablet face down. The G Pad is fueled by a 1.7GHz Qualcomm Snapdragon 600 processor and 2GB of RAM, making it as fast as competing tablets. During testing, screen-to-screen transitions were smooth and games and apps were quick to load. I hardly ever felt any lag, even though the Optimus 3.0 interface is a bit of a doozy to work with (I'll touch more on that later). The 8.3-inch IPS display offers plenty of screen space to play with, and its 1920-by-1200 resolution screen (good for a pixel density of 273 pixels per inch) is ridiculously bright at the highest setting. LG has always been known for its bright displays with impeccable color, and the G Pad continues the tradition. But where the G Pad really falls short is in its battery life. During our battery rundown test, the 4,600mAh battery pack only managed six hours and 29 minutes of constant video playback on a full charge. All of other comparable tablets we've reviewed have outlasted the G Pad by at least an hour or more. The G Pad was fine when it was on standby, lasting for days without needing a charge, but if you're planning on actually using the device, six hours will likely not be enough. The G Pad features a front-facing 1.3MP camera for video chat and your impeccable selfies, and a 5MP rear-facing camera for those times when your tablet is the only camera you have in your hand. You probably won't want to snap important photos with this one, however. Images shot in low light situations sometimes came out indiscernible and grainy, while some pictures came out with faded colors despite the lack of flash. Pictures taken outside fared better, but we seriously caution you against taking a tablet outside to shoot photos. It's not the best social etiquette. In the 1980s, product design was flashy, colorful, busy--and that's kind of what LG has going on with the Optimus UI 3.0 interface, customized on top of Android 4.2.2. There's just too much visual stimulation going on. Even worse, LG took a page out of Samsung's Book of UIs by packing in extra apps and features that you may never use. The worst offender is the custom Notifications shade, which crowds the panel with Quick Settings, QSlide apps, brightness settings, volume controls, and two different settings buttons that lead to two different settings panels. Even if you spend some time customizing the interface to make it less jarring, you'll still have to contend with this Notifications shade. It's not all bad, however. LG bundles in some proprietary apps that might come in handy, like the Notebook application (though you'll want to invest in a stylus to really get use out of that). And LG's QSlide applications can actually be very helpful. As I mentioned in the LG G2 review, they're a series of pop-up, multitasking apps. LG also adds a few gestures to the standard Android repertoire, like the ability to navigate between apps by swiping over the screen with three fingers. LG also offers an app called QPair that's meant to pair up your G2 smartphone with the G Pad tablet. The app notifies you of calls and messages from your phone, and you can use it to tether the phone's existing data connection to the tablet via Bluetooth. It only works if your plan supports shared data, however. The overall design of the G Pad is stellar, and offers further proof of what LG is capable of in that department. It's nice to watch Hulu and Netflix on that big, bright screen, and typing is surprisingly easy on a device this size. But the tablet is still too mediocre in some areas to warrant its relatively high price point (it's about $350 at Best Buy). The battery hardly lasts a day on a full charge and the interface takes a bit of work before you get into its groove. LG was looking to tackle the premium tablet market with the G Pad, but it might do better next time if it declutters its interface and sticks to something a little more simple.